According to some, summer is over. How do they know? Maybe it’s seeing the fleets of yellow school buses filled with precious cargo traveling the roads again; or maybe, it’s the sad sight of local pool clubs locking their doors against the threatening chill of Fall, and worse still, winter snow. But if you listen carefully, you might still hear echoes of fireworks, laughter, sizzling grills, and clinking glasses from recent Labor Day celebrations. That, and the ninety degree temps we’re experiencing today, make us a little nostalgic for the time that was the Summer of 2016. 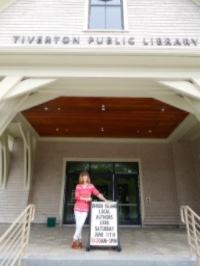 Our summer began with an anniversary party at the Tiverton Public Library in Tiverton, RI. This gorgeous literary resource invited 20 members of the Association of Rhode Island Authors (ARIA), to join them in celebrating one year of serving the Tiverton community, and we were lucky enough to be two of them. There was cake, costumed characters for the kids, and us, bearing books of all genres. Strategically placed inside the library, and out on their scenic veranda, it was hard for the visiting patrons to miss us, and impossible for us not to enjoy the view and the company. 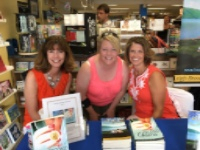 In July, we packed our bags and headed upstate to Naples, New York, and Canandaigua Lake where The Pie Sisters is set. 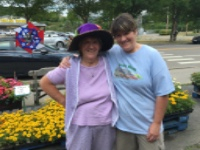 This was our second visit to Joseph’s Wayside Market, a true farmers market extraordinaire. Last summer, we had a wonderful time at the market introducing local and visiting readers to The Pie Sisters, and the Joseph family was kind enough to have us back again this year. We saw a few familiar faces on this visit, and met even more new ones during our two days at the market. We met sisters looking to ‘share a good read’ with each other; we met families picking up ‘welcome back to the lake’ reunion gifts, as well as B&B owners stocking up on reading materials for their guests. The company was abundant and the conversation flowed endlessly. It probably didn’t hurt either that our signing table was right next to the scrumptious bakery table overloaded with pies, cookies, doughnuts, and more. Location, location, location; books always read better with pie. Where better to close out the summer than Mystic, Connecticut, which is exactly what we did in August. Bank Square Books brought us a boatload (pun intended) of new readers and new friends from Texas to South Dakota, Virginia to Maine. 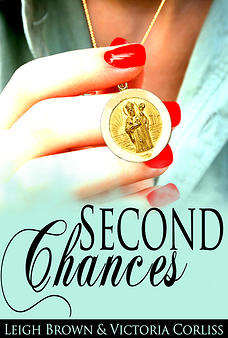 We met more sisters and girlfriends, more mothers and daughters, with sometimes touching, often funny stories of their own to share. Like the ladies of Mystic, each one of the readers we met this summer helped make the Summer of 2016 one we will never forget. Thank you!